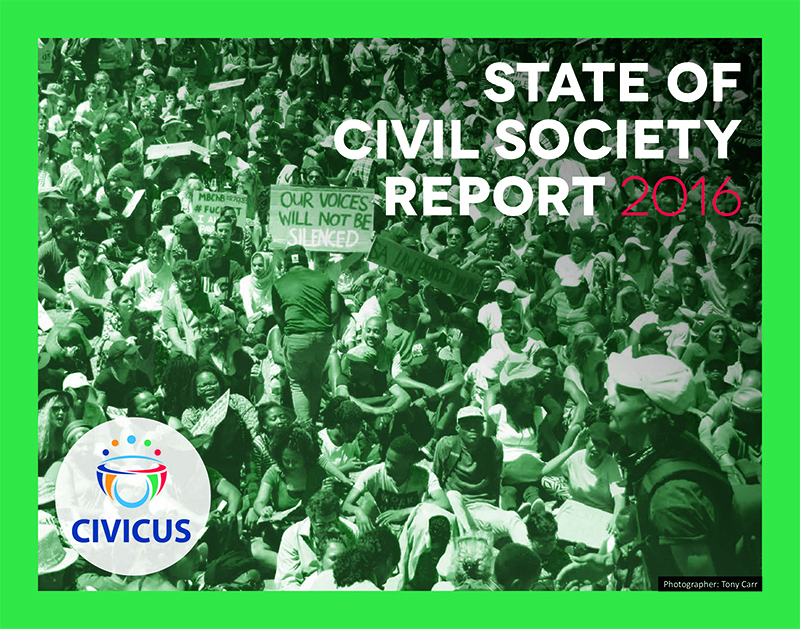 The article reproduced below was published by Civicus in the 2016 State of Civil Society report. This article can be downloaded in pdf format here. The entire report is available here. In the wake of the global economic downturn triggered by the financial crisis of 2008, austerity has become the new normal. Under pressure to reduce budget deficits, many governments have responded with a package of fiscal austerity measures, typically comprising severe cuts to social expenditure, regressive tax hikes, pension and other social welfare reforms, and the stripping away of labour rights protections. The impact of these measures on inequality and human rights has been devastating. As the Center for Economic and Social Rights (CESR) has documented over many years and in several different contexts, the austerity drive has mounted a widespread and systematic assault on economic and social rights, particularly the rights to decent work, an adequate standard of living, food, health, housing and social security. Cuts in public spending and clampdowns on anti-austerity protests have also threatened civil and political rights, such as the rights to freedom of expression and association. Austerity is a factor behind the increasing restrictions on civil society space in many countries, making it more difficult to mobilise for fairer alternatives and to access justice for those deprived of their rights. Austerity programmes are not only spreading across the globe: they are also set to intensify over the coming years. The global economy, having already experienced a major contraction in 2010 and 2011, is now heading into another that is estimated to last until 2020.9 A recent analysis of spending projections in 187 countries shows that the gross domestic product (GDP) of some 132 countries will be impacted on by this adjustment shock, with 81 developing countries set to reduce public spending during the period up to 2020. The global south will be worst affected, with East Asia and Sub-Saharan African expected to be the worst hit regions.10 The same study found that more than 100 countries were planning to reduce subsidies, rationalise social safety nets, cut or cap public sector wages and introduce pension reforms, with scores of countries also planning health sector and labour market reforms in order to adjust to fiscal contraction. Meanwhile, on the revenue side, 138 countries were set to increase consumption taxes, something likely to adversely affect vulnerable populations, and a third of countries reviewed were considering privatising state assets and services. The study also observed that such economic adjustment programs have been promoted by the International Monetary Fund (IMF), the Bank of International Settlements and other international financial institutions in a majority of countries around the world since 2010. That austerity packages are being encouraged and expanded despite ample evidence of their harmful implications for human rights and inequality highlights the extent to which economic and fiscal governance at the national and global level remains a rights-free zone. CESR’s research on financing for international development has shown that a range of progressive tax reforms, coupled with a concerted international effort to confront tax abuse and avoidance, could generate over US$2 trillion dollars in public finance that governments can use to meet their human rights and sustainable development commitments.18 Research in countries that have experienced some of the most dramatic cutbacks to social spending has also shown that a concerted effort to address tax evasion would generate more than enough revenue to achieve deficit reduction targets without any need for spending cuts. Using estimates from the Spanish Union of Tax Inspectors, CESR calculated that a 10 per cent reduction in tax evasion by large corporations and wealthy individuals in Spain would have generated significantly more than the €27 billion (approximately US$30 billion) slashed from the national budget in 2011 to 2012.19 Similarly, the amount lost each year to the Egyptian public coffers through tax evasion and other illicit financial flows represents about a fifth of the country’s total fiscal deficit.20 As Brazil slashes spending on essential services, equality and human rights, little has been done to retrieve the 27 per cent of corporate income tax which is estimated to be lost to tax evasion, or to improve collection of more equitable personal income taxes.21 Tax policy must therefore be at the core of the search for human rights-centred alternatives to austerity. Regressive austerity measures have effectively burdened the poor and disadvantaged with the costs of the economic crisis, while safeguarding the wealth and privileges of the economic elites responsible for causing it. Outrage at this unfairness has at times boiled over into the streets, with mass mobilisations against austerity and inequality in many parts of the world. The demand for governments to respect basic social rights and tackle extreme inequality has been a unifying feature of these movements. Indeed, the commonality of the injustices experienced and demands made has helped foster transnational solidarity, empowering activists in each context, and in some cases helping secure significant victories.22 In some cases, they have spurred the emergence of new political forces in response to popular frustration with more established alternatives. Spain’s controversial Decree Law 16/2012, which effectively excluded undocumented migrants from accessing universal healthcare following austerity cuts to the health budget, was passed as an emergency decree, bypassing the normal parliamentary approval process. This was followed by the Ley de Seguridad Ciudadana (Public Security Law), more commonly known as the ‘Ley Mordaza’ or ‘Gag Law’, which represented a dramatic crackdown on the wave of public protests against austerity measures. The law, which provoked an outcry from civil society organisations (CSOs) and human rights oversight bodies,24 threatened fines of up to €600,000 (approximately US$677,000) for participating in unauthorised protests near government buildings and public facilities, and €30,000 (approximately US$33,900) for filming the police during demonstrations, a response to widespread national and international concern at media images of the heavy-handed policing of anti-austerity demonstrations.25 The ‘Ley Mordaza’ also included provisions for the summary expulsion of migrants and refugees, overtly contravening international human rights law. Just as CSOs in austerity-hit countries see the space for civic participation and dissent being stripped away, they are also facing capacity limitations as their funding dwindles. Spain cut its development assistance budget by 49.7 per cent in 2012,26 affecting the funding of many Spanish CSOs also addressing poverty and inequality at home, as well as shrinking funding to civil society groups in Latin America and other regions. With spaces for political participation and social mobilisation being shut down, social justice advocates in many countries have turned to legal or quasi-judicial processes to confront the human rights violations unfolding in their countries as a result of austerity measures. This has included litigation before national courts and recourse to regional and international human rights oversight bodies. The goal of such efforts has been to bring the principles and tools of human rights law to bear in challenging austerity policies and the spectrum of human rights deprivations they have entailed. At the national level, there has been a proliferation of litigation initiatives aimed at challenging the legality, and remedying the impacts, of unjust austerity policies. In Spain, groups working on the right to health, as well as certain local government authorities, challenged discriminatory healthcare reforms that excluded undocumented migrants from universal primary care, leading to a partial policy reversal and a ruling by the Supreme Court that local governments could design their own law to extend coverage to the affected sector. Portugal’s Constitutional Court meanwhile struck down over €1 billion (approximately US$1.1 billion) of the €5 billion (approximately US$5.6 billion) in cuts that had been planned in the country’s 2013 budget, invoking constitutional human rights provisions. The limited potential for seeking domestic legal remedies in some contexts has led many civil society groups to seek accountability at the international and regional levels. For example, coordinated civil society engagement in shadow reporting led to the governments of Ireland and Spain being called to account for their austerity programmes before the UN Committee on Economic, Social and Cultural Rights. In both cases, the UN body issued strong recommendations concerning the human rights impacts of reforms, echoing civil society concerns. Following its 2012 review of Spain, the Committee was moved to issue guidance to all states clarifying their human rights obligations in the context of crisis and austerity.28 It warned that, in accordance with the principle of non-retrogression, which prohibits any backsliding in economic and social rights protection, any austerity measure that might reduce the enjoyment of these rights can only be justified after careful consideration of all alternatives, such as progressive tax reforms or reallocation of resources from other areas. As the austerity juggernaut continues to thunder forward civil society must open up new avenues for accountability to confront the injustice of austerity and inequality. While strategies to achieve this will of necessity by manifold, one clear opportunity for international civil society collaboration lies in the recently agreed Sustainable Development Goals (SDGs). The SDGs contain commitments to policy reform over the next 15 years that, if implemented, would reverse many of the harmful trends and impacts witnessed in the era of austerity. SDG10, for example, commits governments to reduce inequality within and among countries, including through fiscal, wage and social protection policies, along with improved regulation of the finance sector. The SDGs and the Financing for Development agreements also include commitments to tackle illicit financial flows and improve international cooperation in tax matters. Such commitments are timely. The Panama Papers scandal highlighted the nefarious impact of tax abuse by wealthy elites in depriving government coffers of the revenues needed to tackle inequality and fulfil human rights, just as the most disadvantaged sectors of the population see wages stagnate, social protection slashed and services they rely upon cut through austerity measures. The SDG commitments will remain paper promises unless there is ceaseless vigilance and pressure from civil society for their implementation. They will also require meaningful accountability systems at national, regional and international levels to ensure that the targets set are reflected in all relevant policy programmes, and that governments and the private sector are held answerable. Whether the SDGs live up to their potential depends on how effectively civil society activists around the world can maintain the pressure for human rights to be at the core of the economic and development agenda, in order to bring about a transformational shift from austerity to accountability. 9. Ortiz, I., Cummins, M., Capaldo, J., Karunanethy, K., “The Decade of Adjustment: A Review of Austerity Trends 2010-2020 in 187 Countries”,SS Working Paper No. 53, International Labour Organisation, The South Centre, Initiative for Policy Dialogue - Columbia University, 2015. 11. CESR, Fiscal Fallacies: 8 Myths about the Age of Austerity. 2014, Available at: http://www.cesr.org/article.php?id=1331; See also: Ortiz, I. (et al), op cit fn 9. 12. Ortiz, I. (et al), op cit fn9. 13. See for example United Nations Conference on Trade and Development, “On the Brink: Fiscal Austerity Threatens a Global Recession”, Policy Brief No 24, December 2011; see also the reports on austerity by the UN Special Rapporteur on Extreme Poverty and Human Rights and the UN Independent Expert on Foreign Debt and Human Rights. 14. Ortiz, I. (et al), op cit fn9. 16. United Nations Conference on Trade and Development (UNCTAD). Development-led globalization: Towards sustainable and inclusive development paths (Geneva, 2011). 17. For more on this see: ILO, “Fiscal Space for Social Protection: Options to Expand Social Investments in 187 Countries,” ESS Working Paper no. 48, 2015. 18. CESR, A Post-2015 Fiscal Revolution, Human Rights Policy Brief, May 2014. 19. Center for Economic and Social Rights, Spain Facsheet, 2011. See: http://www.cesr.org/article.php?id=1285. 22. For example, civil society pressure forced the Irish government into a dramatic climbdown over its plans to introduce water charges in the country, and parties compaigning in the recent general election competed to outdo each other in distancing themselves from plan. 27. CEPEJ, “Evaluation of European Judicial Systems 2012”, 2012; European Union Agency for Fundamental Rights, “Annual report 2012”, 2012. 28. The letter issued by CESCR affirms that in order to be in compliance with the Covenant, any policy implemented to address economic crisis should be: temporary, covering only the period of the crisis; necessary and proportionate, in the sense that the adoption of any alternative policy, or a failure to act, would be more detrimental to economic, social and cultural rights; non-discriminatory and cognizant of all possible measures, including tax measures, to support social transfers and mitigate inequalities, and that it protect the minimum core content of economic, social and cultural rights. 30. For more on this, see: “Human Rights in Tax Policy”, http://cesr.org/article.php?id=1622; See also: “Lima Declaration on Tax Justice and Human Rights”, 2015, http://cesr.org/downloads/Lima_Declaration_Tax_Justice_Human_Rights.pdf.